A link to "Configure the landing page for your Business WiFi Pro network" will be sent via email. Your link to 'Configure the landing page for your Business WiFi Pro network' has been sent! 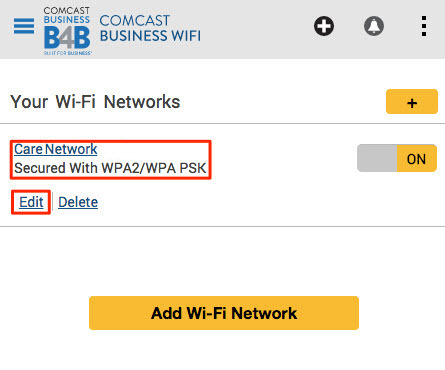 Business WiFi Pro allows you to set a landing page for your Guest WiFi network, so customers connecting via the Guest WiFi network will see on a business-specified website when they open their first browser window. For example, Joe’s Pizza might direct their customers to joespizza.com, which can offer social integration links and coupons. Note: Please be advised, any feature or configuration change will cause the WiFi Pro Access Point(s) to reboot. Both Private and Guest networks will go offline for 3 to 6 minutes as the change is applied. 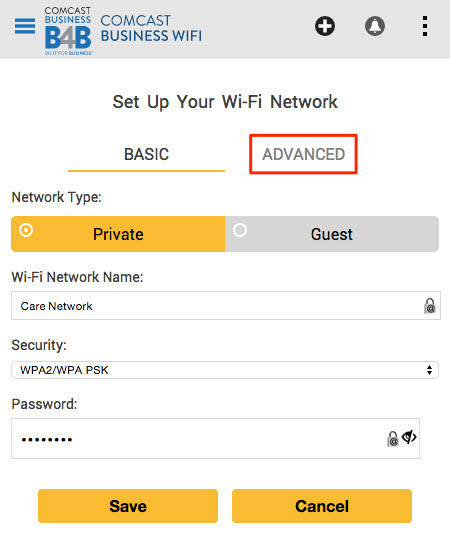 Navigate to the WiFi Pro Portal. Once signed in to your account, you will see your existing networks. Locate the network you want to configure and select Edit. Redirect URL - If you want to direct customers to your business' website, enter it here. The landing page will not be customized if there is a redirect URL. Design Splash Page - Comcast does not support the design or creation of the customer splash page. Please watch this WiFi Pro Splash Page Designer Overview video for self-service instructions on how to customize a splash page for your business. Splash Page Designer includes a Social Media Integration plug-in, which allows your customers to sign in to your network with Facebook, Twitter and Instagram. Watch our Social Media Configuration video for more information. 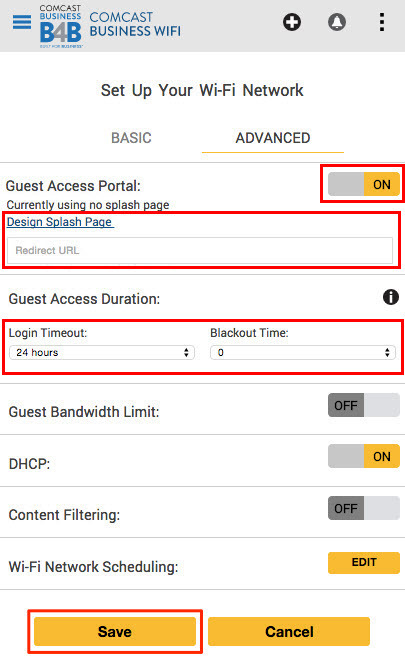 Login Timeout - This time will determine how long a customer can stay connected to the Guest WiFi network. The default is 24 hours. Blockout Time - This time will determine how long the customer must wait before connecting to the Guest WiFi network after their session has timed out. The default is 0. Select Save when you are finished. The Business WiFi Pro Portal is a web-based app that provides access to set up and configure your Business WiFi service. Create your Private and Guest WiFi networks. Schedule the availability your Private and Guest networks.